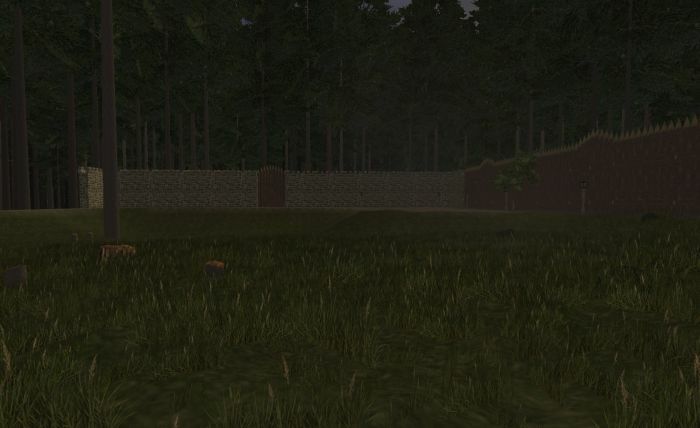 Building a Keep #WurmOnline – Nomadic Gamers, eh! With a little creativity in WurmOnline, players can create some interesting structures. My primary deed is a country cottage. There’s cobblestone paths, a little beach, a waterfront that’s got some trees and very little “build up” on the area. I have rows of gardens and fruit trees, and I’ve planted a lot of maple on the deed because they look fantastic. A little stone pen at the back for some horses and dogs that I’m currently breeding. In other words, the area isn’t that fancy and that’s quite intentional. My neighbour to the East has decided to move on from Wurm, and they’ve left me their deed. I picked up the papers with Stargrace (my alt) and now own a property called “Fippy’s Keep” – which fits in well with the EQ1 motif that our little group has going on. The property doesn’t have much to it at the moment, two buildings, and three large fields. Half of a stone wall was built when I acquired it and I’ve decided to carry on with the idea that it will eventually become a keep. Yesterday I managed to complete one of the walls entirely, which took a lot of bricks. Trees, too. There are six gates to the deed, four of them face west (two of those lead to animal pens) one to the south, and one east. Eventually I’d like to surround the entire deed with these walls, and from there continue to build inside. I haven’t quite decided how I want to go about this yet, the deed is an odd size, 13 by 41. The number of stone bricks that would take to cover the entire deed would be a huge amount. Each wall takes 20 bricks and there’s always a lot of failures. So I haven’t quite decided what I want to actually DO with the deed yet but at least I have some rough ideas. I’ll be sure to keep posting my progress here, I’m anxious to see how it turns out!